Ananka's Diary: Gadget Contest Update! Oh my gosh! You are so lucky! At least I have Kirsten Miller's autograph. Anyway, congratulations! No. Way. That's. So. Awesome. Way to go, Hania! I can't wait to read it! Wow. So is it the third book? Or are you already done with the 3rd and you mean that Hania will be featured in the fourth? Is there going to be a fourth? Oh I wish there's a fourth! And many more Kiki Strike books! WOW! that is so awesome!!! THAT IS SO COOL!!! Congratz Hania! I was so right! My friend and I both guessed that the winning gadget would appear in the next "Kiki Strike" book. I can't wait to read the next book!!!! I can't wait to see what role the Fake Blood Chewing Gum has in the next KIKI STRIKE book!!!!! Wow! Congratulations to you Hania! That is the coolest surprise prize ever! Dahlia and D.O. : Me too. I thought that "Hania" would actualy be a persom in the book, though. Hello and thanks for featuring the map of New Brainland. 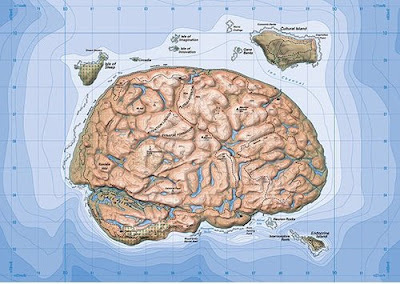 The map was made by myself, a cartographer based in Wellington, New Zealand, but was not so much to do with any type of scientific representation of regions of the brain. It was more an illustrative map for the cover of Neuron magazines issue on brain maps which def covered the more scientific side. As it was produced by a cartographer with some of the data compiled in ArcGIS it does have underlying principles of cartography that may have been lost if this was put together as a pure illustration by a less spatially experienced designer. Note the outlying islands are all real islands and real 1:50,000 NZ GIS data moved and rotated onto the imaginary projection system used for the map. If you or your readers are interested there are free wallpapers for download available from http://www.unitseven.co.nz.